When I mentioned in my Age of Aquarius post that Phil and I had been "hacking our way through trackless rainforest," Phil objected that "hacking" suggested that we had had machetes, and also (he added later) that we were moving through the forest in a rather destructive way. I wondered what verb would give me the sense of "hacking, but without machetes and therefore (a) more environmentally sensitive but also (b) much more difficult and hence (c) ultimately a more compelling tale." Teresa offered "thrashing." Close. In place of the decisive male hard-k of hacking, thrashing offers a sibilant, the sound of plants brushing past us, and the awkward sound of "thr" gets a bit of the leftright lurching quality of our motion. So yes, we were thrashing, and on the way, I was waving the camera about. The blurriest ones seem best at recalling the experience. 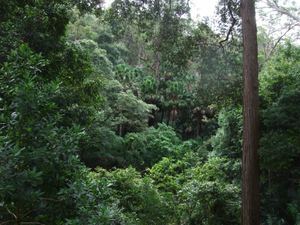 This rainforest huddles on the eastfacing slopes of the Illawarra Escarpment, near Austinmer between Sydney and Wollongong. Apart from the stinging trees (Dendrocnide) and various prickly shrubs, the biggest obstacle was presented by lianas -- vines that have thickened into woody trunks while retaining their scribbly form. 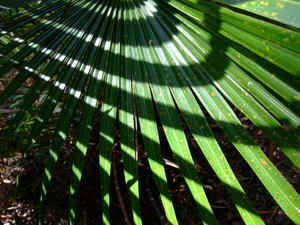 As often in rainforests, the only real view is at the edge. With the rainforest all around you, it's hard to see figure and ground, and even harder to manage the uneven light, which explains my abstract expressionism above. Only at the edge, where the rainforest gives way to sunny slopes awash with exotic Lantana, could I form a conventional view. I've been in Australia for more than two years now, and each day I feel more American. At other times in life, I've responded to cultural difference with a scrambling desire to learn the local codes, to fit in. Now, I'm more likely to treasure my incomprehension. A single precise strip of very old pavement, obviously the remains of an ancient airport for centimeter-high aliens. When my Australian companion explained that this had been a cricket pitch, I decided I never wanted to understand cricket, and I never have. The alienness of this game -- a game you can play for an entire day and still not know who's winning -- was just too rich to surrender in return for mere cultural belonging. It goes on, rendering hours of play in a few hundred words. Reading, I was reminded of various times that I've read ancient or non-western narratives, translated into English but still barely comprehensible. Narratives designed for oral transmission, such as the Buddhist sutras or the Upanishads, are intensely repetitive, seemingly the opposite of a telegraph cable. But if you take out the repetition, there's a similar half-opacity to them, a sense that to read them in full you'd need to add not just language, but an entire culture. They also seem to lack emotion as they describe momentous events, as though this too could be supplied entirely by the listener. If I shared the culture of cricket, and could reconstitute the game from this text the way water reconstitutes freeze-dried food, all I'd have would be a cricket game. Without that cultural knowledge, I can rest in the puzzle itself, drawn into interest by glittering shards of the familiar. Reading the text this way, I can savor the cultural vastness of a not-yet-shrunken earth, one that still has room for the heroic. I like it that way. If I ever figure out cricket, just shoot me. One afternoon, I opted out of the 4:00 PM sitting, feeling an urgent need to be outdoors, to lie in the grass in the slanted sun and feel a sense of being on holiday. I found a good patch of grass, with the sun behind me, and gazed randomly into middle distance at the top of a Eucalyptus punctata, where something was moving. Sometimes I have to bring an Australian plant home, and live with it for a while, before I start seeing how truly alien it is. Every time I encounter a new landscape, I look for home. Home for me is not on the map, but if you insisted I'd say it's in Oregon and Northern California. 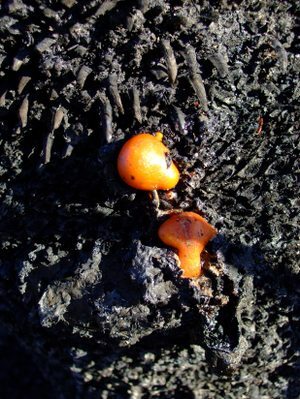 Deep forests flourishing in volcanic earth. A coast of coves and promontories. Islands and mountaintops looming in the mist. When I'm somewhere else, I experience not just the absence of home, but an absence shaped like home. Mainland Australia strikes me as flat because home is mountainous, dry because home is wet, sparsely forested because home is lush, sedimentary because home is volcanic. Just south of the mainland, though, is a place that is home in all these ways, and here the sensation of not-home must become richer, more nuanced. Tasmania is a volcanic island in the latitudes of Oregon and Northern California, and its rainforests, valleys, coastlines evoke those places so strongly that I must remind myself that I'm on the other side of the world, and that everything that looks so familiar is really completely alien. 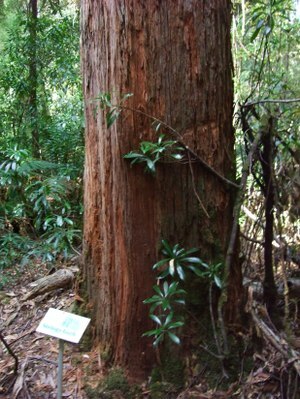 This, for example, is a eucalyptus. To a Californian, this simply has to be a coast redwood. It's like a redwood not just in the size and color, but also in texture: soft and almost clothlike to the touch. Look up, though, and it's definitely a eucalypt; the red-brown trunk transitions to grey and the straight lines give way to typical eucalypt curves. This 200-foot giant is a Eucalyptus obliqua, and Tasmania has whole forests of them. But because "home" to me includes redwoods, the knowledge that this is a eucalypt doesn't quite banish redwoods from the scene. Instead, my mind fondles the riddling distance between these two familiar trees. By what mechanism do unrelated trees evolving on different continents end up with the same deep, soft, red-brown bark where they touch the earth? Is there some evolutionary advantage to having this bark texture at ground level when a tree gets to this size? 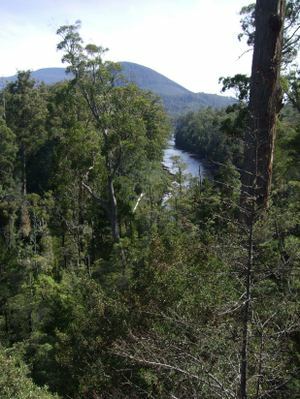 ... except that every plant is different, and tannins give the river a coppery hue, and the slight bluish tint of the distant hill betrays an atmosphere laden with eucalypt oil. Yesterday's trip to Hartz Mountains National Park, and the adjacent rainforest, was a sensous exploration of home-as-elsewhere. Whereas mainland Australia confronts me with dramatic difference, Tasmania is rich with similarity, which renders its differences more intimate, more sensuous. 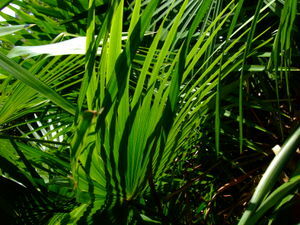 Driving through the rainforest, for example, the trees frame the road in the familiar, enclosing way, with a row of ferns hugging the road at ground-level. But in Tasmania, the fern is the great billowing Dicksonia antarctica (click for pic). It makes the roadside look soft, as though I'm driving between rows of luxuriant giant pillows. 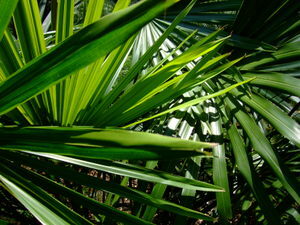 Sometimes a plant will look familiar but behave strangely. 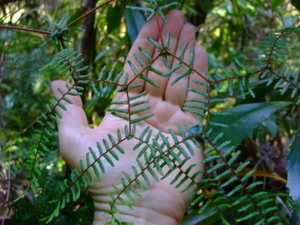 In the rainforest I notice a familiar-looking fern with a striking behavior: it branches at exact 120-degree angles, evenly spaced, to construct a web of perfect hexagons. I'll come back to Tasmania for this intimate quality of its strangeness. Where the mainland is strange in big, confronting ways, Tasmania is strange like a touch where nobody ever touches, or a breeze from a new dimension. A Forestry Tasmania sign on the road from Geeveston to Hartz Mountains National Park. 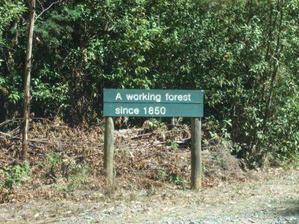 Before 1850, it must have been a slacking forest. 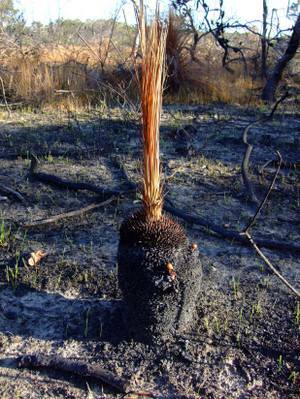 Not long after writing the last entry, on the 2003 Canberra firestorm, I happened on a very different fire landscape in the Kuring-Gai Chase National Park, just north of Sydney. 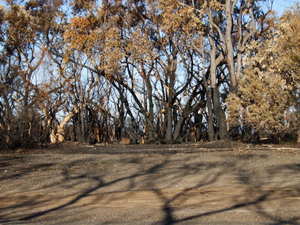 A typical low-eucalypt woodland had undergone a quick, light fire. A flashfire. It burned nothing down, but consumed only color and texture. Thus edited, trees wore the same black trunks as their shadows. 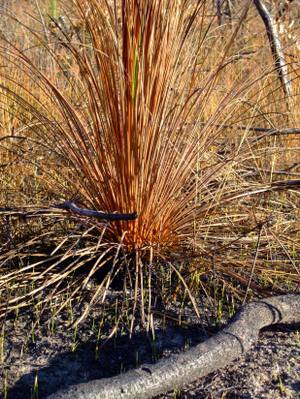 Some characteristic oddities of Aussie flora look even odder under this black-and-sepia filter. 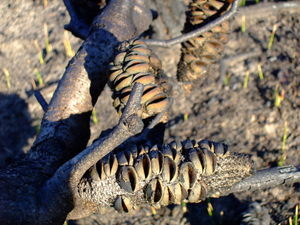 Spent Banksia cones, say. Xanthorrhea bollards are black-trunked anyway, so the brown could pass for seasonal desiccation. This was an amiable, healthful, invigorating fire. Not firestorm, but a fireshower. A firebreeze. A breath of fresh fire.